Dental crowns and bridges fit over injured, discolored, or cracked teeth or fill the space resulted after dental extractions and protect the teeth from further injuries or damages helping also to the prevention of any toothaches or discomfort you may experience. We are well known for our expertise with Dental Crowns and Bridges. During your first visit with Citigate Dental, our dentists will prepare your tooth structure and then take an impression of the prepared tooth, make a temporary crown to place on the tooth, and send the impression to a dental laboratory to fabricate the crown. At your next visit, we will try-in the crown to ensure a good fit and then cement the crown in place. When a tooth is compromised by decay or damage, we may suggest a crown, inlay, or onlay. These restorations, made in a lab from fine dental porcelain, will blend seamlessly with your teeth, return the strength that you need for comfortable oral function, and maintain your all-white smile. Bridges are fixed, or non-removable prosthesis constructed to replace one or more missing teeth. The teeth on both sides of the existing space are used to attach the bridge to restore functionality and aesthetics. Materials used for this process are noble alloys, porcelain or porcelain fused to metal. Bridges are indicated whenever at least one tooth is missing. A bridge is composed of abutments and pontics. 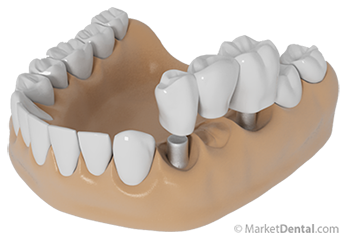 Abutments are the supports for the bridge and consist of crowns placed on the teeth surrounding the empty space. The pontics are special crowns that span across the empty space and connect to the abutments. When teeth are prepared for a bridge, the abutments are prepared for crowns just as described in crowns. We will then take an impression of the prepared teeth, make a temporary bridge or crowns to place on the teeth to protect them and maintain their positions, and send the impression to a dental laboratory to fabricate the bridge. At your next visit with Citigate Dental, we will try-in the bridge to ensure a good fit and then cement the bridge in place. Here at Citigate Dental, we offer Crowns and Bridges services to our patients. If you have missing teeth, please call us at 613-440-4423 and book a consultation with our dentist to discuss your options .